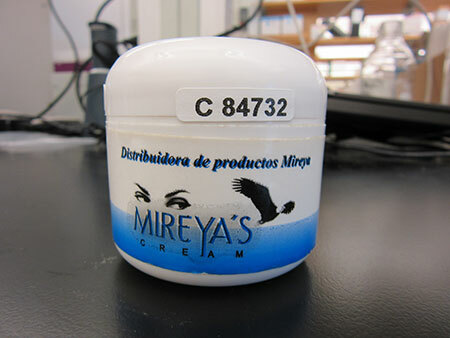 Mercury can be found in some skin cream that is homemade or manufactured in Mexico, Asia or the Middle East, that is marketed as skin-lightening lotion. These creams can be dangerous to yourself and people you come into contact with. Mercury exists in various forms, and people are exposed to each in different ways. The most common way people in the U.S. are exposed to mercury is by eating fish containing methylmercury. Other exposures may result from using or breaking products containing mercury. If you are concerned for your health or your family's health as a result of a potential exposure to mercury, get in touch with your physician or other health care provider. They will be able to tell you if the degree of mercury exposure is a concern, and what to do about it. Do not use creams containing mercury. Exposure to mercury can have serious health consequences. It can damage the kidneys and the nervous system, and interfere with brain development in unborn and very young children. If you suspect you have been using a product with mercury, stop using it immediately. Thoroughly wash your hands and any other parts of your body that have come in contact with the product. Contact your health care professional or a medical care clinic. If you have questions, you can call the Arizona Poison and Drug Information Center at 800-222-1222. If you have any products that may contain mercury, it is important to properly dispose of this hazardous waste. Do not throw out in the trash or down the drain.